Our 100% online DOT HAZMAT Training: Carrier Requirements – Highway course provides training for employees involved in HAZMAT shipment by U.S. highway, such as drivers involved in hazardous materials transportation or hazardous materials packaging / loading / unloading for shipment. This training is based on Federal DOT regulations in 49 CFR Part 177 and FMCSR Regulations Parts 300-399. Our DOT HAZMAT Training Online: Carrier Requirements – Highway course is designed for all employees involved in the shipment of hazardous materials by U.S. highway, such as drivers who transport hazardous materials, or persons who package or load/unload hazardous materials for shipment. View a Detailed Course Outline below. Based on Federal Department of Transportation (DOT) regulations in 49 CFR Part 177 and FMCSR Regulations Parts 300-399, the course material focuses on the DOT requirements for shipping hazardous materials by highway. Training topics include shipping responsibilities, general and special loading/unloading requirements, shipping paper and certification requirements, and incident reporting requirements, among others. HazMat Student’s Online DOT HAZMAT: Highway provides students high quality training through a state-of-the-art Online Training System. The course combines audio narration, written text, relevant photos, and interactive elements to help students retain the information. Students also benefit from a downloadable student manual which can be used as a reference for the course material and for note-taking. See adjacent sample page. Throughout the course, critical information is reinforced and students are prepared to be successful on the course exams. When the course is completed, students are able to immediately download their course completion certificate. Carriage by highway | Federal motor carrier safety regulations | HMR and FMCSR | Motor carrier responsibilities | Training | State and municipal laws | Broken or leaking packaging. Securing of packages | Orientation markings | Smoking and fire | Use of tools and handbrake | Precautions in transit | Attendance requirements | Closure of manholes and valves | Use of cargo heaters | Carrying and unloading tanks. Special loading and unloading requirements | Separation distances | Exclusive use vs. sole use | Marking requirements. Shipping paper accessibility | Shipper’s certification | Driving and parking rules | US DOT inspections. Reportable incidents | Notifying the NRC or CDC | Reporting radioactive material, infectious substances, and marine pollutants | Information contained in a report. The objective of this DOT HAZMAT Highway Carrier Requirements course is to address the requirements of 49 CFR Part 177 and 177.816 of the Hazardous Materials Regulations (HMR) and Federal Motor Carrier Safety Regulations (FMCSR), Parts 300-399 for hazardous materials transportation. Once the course is completed, you will immediately be able to download, save or print your Course Completion Certificate which is provided through our Online Training System (OTS) in PDF format. We’ll also mail you a PVC credit card style Wallet ID Card with optional photo, showing training course completion. The card will be mailed within 24 hours of course completion. This DOT HAZMAT training online course consists of 5 sections, which are fully narrated and interactive. Quiz questions within each section of our Online Training System (OTS) help the student retain the knowledge needed for the final exam. This DOT HAZMAT Training: Carrier Requirements – Highway course was designed by Certified Outreach Trainers and is based on the DOT regulations found in 49 CFR Part 177 and FMCSR Regulations Parts 300-399. HAZMAT employers are required to train new HAZMAT employees within 90 days of employment or assuming new HAZMAT related job responsibilities. Direct supervision is required of the employee performing a hazardous material function until training is complete. DOT requirements specify HAZMAT employees need to be retrained and tested at least once every three years. Highway carriers where HMR applies must train and test HAZMAT employees as required prior to involving them in the transportation of hazardous materials. Please note that this DOT HAZMAT Highway course is not meant to replace company-specific or function-specific training provided by your employer on equipment use and procedures for your particular work environment. You must be trained by your employer on the hazards, equipment, engineering and administrative controls, safe work practices and emergency plans specific to your role and workplace. Employers need to evaluate employee needs for additional DOT hazardous material training and training in the use of personal protective equipment used on the job. 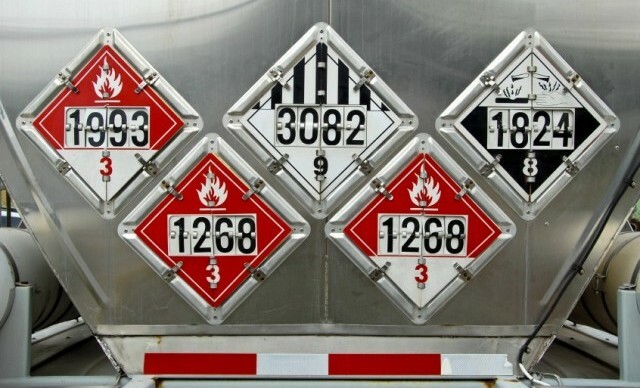 For more information on DOT Hazmat training requirements, the Federal Motor Carrier Safety Association (FMCSA) has excellent resources on their website, including extensive information on highway Hazmat transportation compliance.